Pinnacle Entertainment (ticker:PNK) is a small-cap gaming company whose assets were particularly hard hit by Hurricane Katrina. Here is their Casino Magic Biloxi property. The company yesterday held a call to talk about the damage they have suffered both in Biloxi and to their Boomtown New Orleans property. 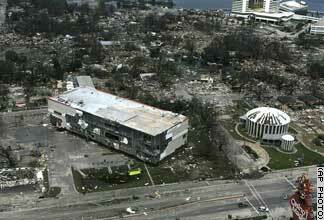 It was announced that the Biloxi casino needs to be rebuilt and will be with with the insurance proceeds. But the company faces a double-edged labor issue. One of the ironic things we started looking at it and we are very concerned — what do we do with the 900 employees? We are continuing to pay them now. We can’t continue to pay them forever. No company can afford to pay people forever who are not working. [Also,] how are [we] going to find people to work on rebuilding? Because as I said a minute ago, carpenters are going to be in short supply. Labor on payroll that doesn’t fit their labor needs. Pinnacle has been handling this situation remarkably well, putting their workers’ first and handling the devastation with calm focus. Their solution to this particular problem is pure genius. [Our] HR people are fervently trying to search out how to set up courses or classes for our employees that while we are getting organized, we teach dealers how to swing a hammer. And even people who work in housekeeping — there is a lot of people pushing brooms on construction sites. We applaud PNK’s creativity under tough circumstances, even if we are dubious as to how well it will work in practice. The workers will definitely be incented to try and make the switch but most dealers I’ve seen seem to specialize in three things, namely, being a dealer, being a degenerate gambler on their spare time and ruthlessly crushing my spirit.